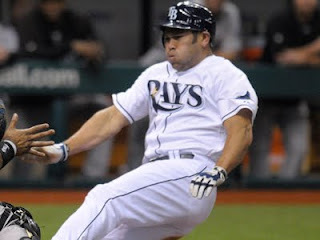 I was critical of the Tigers when they signed Johnny Damon before the start of the 2010 season. Earlier that off season, they had unloaded Curtis Granderson and Placido Polanco to save money. Then, at the last minute, here comes Johnny Damon for a year and $8 million, seemingly because his boot-licking about loving Greektown and Steve Yzerman worked, and because, from what I was told, owner Mike Ilitch has always admired Damon as a player and simply wanted him on his team. Circumstances are completely different now. Damon is in his late 30s and his skills have eroded typically, but he still remains a reasonably productive player. He is a free agent late in January and subsequently his price tag is going to be reduced. The Tigers just had a probable season-ending injury to their premier DH, Victor Martinez. They aren't going to replace him with a clone of VMart. They just don't exist. They must mix and match around the injury. The other options, which are along the lines of trading top prospects for Houston slugger Carlos Lee, aren't particularly viable. The Tigers need to hold their prospect chips until after the season starts, and react to the developments from there. Damon is used to DH now. It was his full-time position last season. He hit second mostly for Tampa Bay, but did get 166 at bats in the leadoff spot and had a .343 on-base percentage and a .294 batting average. If Austin Jackson doesn't improve, he gives the Tigers another option there. He also displayed some power last season. It doesn't solve the Tigers the "who will hit behind Miggy" question, but what player is? Signing Damon would augment the Tigers' lineup relatively inexpensively with a veteran player who has played consistently with winning teams, and generally done well in pressure situations. There are other options. Juan Pierre sounds good in theory, until it is noted how he doesn't have any power, was thrown out 17 times last season attempting to steal in 44 attempts and had just a .328 on-base percentage as a lead off hitter. He would an upgrade from Delmon Young defensively in left field. Raul Ibanez is actually older than Damon, and tools seem to have eroded more. if they sign an aging vet for DH, that hitter is likely to be the team's 2012 version of Brad Penny...viewed as a disappointment because current performance cannot live up to a reputation built on a long, successful career. trade is still a possibility. picking up a guy who's a free agent next year could give them one solid season without selling off their best prospects. Padres did a move like that to acquire Quentin. if improving athleticism of the club is a priority, they'll need to go that route instead of pursuing the remaining crop of free agents. I'm ambivalent about a return of Damon. hoping there are better alternatives. Pat, like you say it does not protect Miggy but does set the table for the guy hitting after Miggy. He does have a WAR value. I wouldn't go with it though. I would look for a player that can play the field. To me that spells Betemit. He can platoon with Inge and provide left handed bat. Move Kelly to 2B to platoon with Santiago and but Raburn in LF. Raburn at 2B is not good. He not a bad LF with a good arm and range beside the annual blooper. Then put DY in the DH spot. This should improve the team overall D. I still like to see another bullpen arm such as Wheeler. I know Wheeler does not impress you with his stuff but he gets the job done. The point is not winning the Division, Tigers can do that with their eyes closed. Illitch and fans want a World Series. Is this team good enough, without VMart to win a World Series? That is the question. Pat, Signing Damon seems more like an easy answer instead of a right answer. We know Damon, hell we like the person - and he does have leadership qualities and he does make things happen. But I don't think he can make enough things happen. He would suffice in the role - but is he the best player out there available? I'm not a fantasy league guy, so I yeild to others to toss out names - But Damon seems to be just not enough. We're really close now. We just need that next step - even without V-Mart. Damon stride is big enough to take us that next step. You make a good point, but thing is, Penny did have a stretch where he was 7-4 with a 3.51 ERA over a key period the season. It did help the Tigers immensely. Damon might provide the same thing for an extended period of season. Seems like he has more left in the tank than other players they are considering. The Wilson Betemit ship has sailed. It was obvious Leyland soured on him last season, and never was that high on him even when he was playing well. Probably not, but while the Tigers are going to favorites to win the division, it's not a given. They have to cover their flank inexpensively while keeping their best prospects available for trade during the season seal a team that could win the WS. To me, Damon would be the period bridge for this year under the circumstances. I also believe they need to be aggressive near the trade deadline rather than now. Their is no need to panic, in my opinion.